The University of Arkansas - Fort Smith offers a Bachelor of Science degree in Middle Childhood Education (Grades 4-8) with concentrations in English, Math, Science and Social Studies. This coursework meets Arkansas and National Middle School Association standards for teacher licensure in middle childhood. The purpose of the Middle Childhood program is to provide highly qualified teachers for the middle (4-8) grades. The program provides a strong focus in specialized content areas as well as significant coursework in professional education. In addition to specialized coursework, the program includes general education courses to provide additional content preparation and background knowledge and skills necessary for a liberal education. As a whole, the curriculum is designed to be applicable to someone preparing to teach the early adolescent. The National Council for Accreditation of Teacher Education (NCATE) was founded to accredit teacher certification programs at U.S. colleges and universities. NCATE is a council of educators created to ensure and raise the quality of preparation for their profession. NCATE is recognized as an accrediting institution by the U.S. Department of Education. 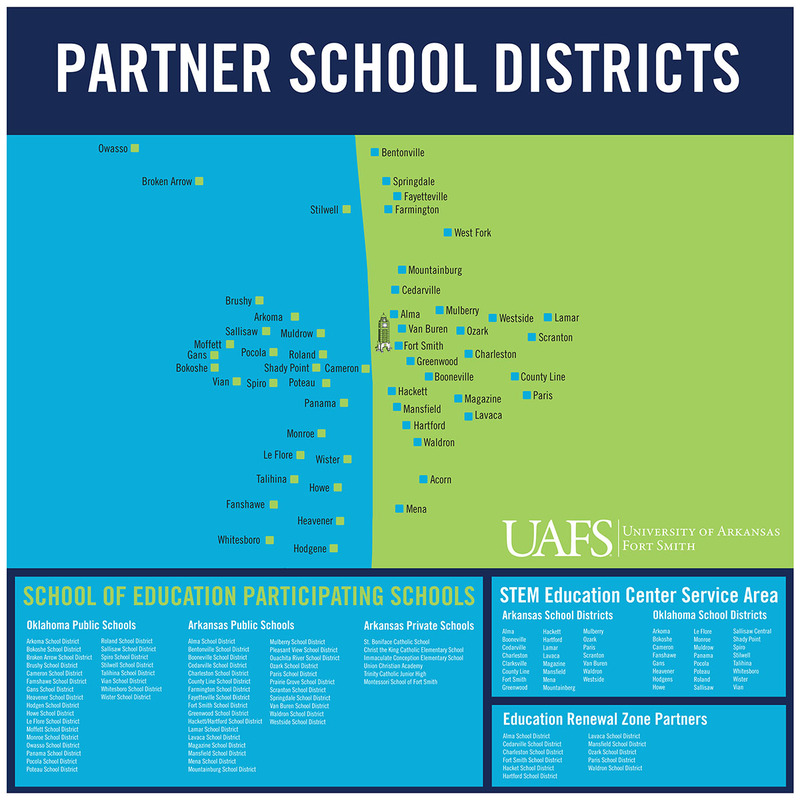 A special congratulations recommended UAFS because the Council “…cited no areas for improvement relative to any of the standards.” This is formal recognition and a guarantee that the School of Education and all of its programs and practices meet and exceed rigorous state and national standards and that quality teacher preparation is provided equivalent to the nation’s top colleges and universities. Content Knowledge. Demonstrate content knowledge by successfully completing PRAXIS II and the Principles of Learning and Teaching exams. Learner & Learning. Demonstrate an appropriate response to diversity in the middle level classroom by successfully completing two diversity related assignments. Instructional Planning & Practice. Successfully develop and implement an integrated unit of study for 4th-8th grade students (middle level). Professional Responsibility. Successfully collaborate with families and community members in order to motivate all young adolescents to learn.